Fujitsu Inverter Wall Mounted Split System air conditioners supplied and installed by Tapair are operated with an easy to use infrared remote control. The most often used functions are clearly marked for convenience and ease of use, allowing you to quickly set your preferred comfort level. 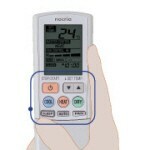 Some units also allow for settings to be adjusted via an optional wired remote for added control. Please ask Tim for more information if you are considereing the option of a wall mounted control panel for your air conditioning. With a Fujitsu Wall Mounted Inverter air conditioner, guaranteed comfort is only a button press away. They offer the convenience of built-in timers including a sleep mode so you can rest assured knowing your split system air conditioning is working quietly and efficiently. The program mode allows you to set the start and stop time so when you’ve been out, you can come home to Fujitsu comfort. The infrared remote control also allows you to control the fan speed, air direction and cooling or heating cycles amongst a host of other features.